WARNING! What you’re about to hear is alarming… and may upset you. In the weeks and months ahead, you and your loved ones will face challenges unlike anything you’ve seen before. Because the greatest social, economic, and political upheaval since the American Revolution is on our doorstep. And its combined effects could cause stocks to crash as much as 80% beginning just weeks from now… crippling your wealth now and for the rest of your life. After all, I’ve been making predictions that people are skeptical of for decades… but one after another keeps coming true anyway! And when you see the evidence for yourself, you’ll know why my latest forecast is 100% spot on too. There WILL be blood in the streets... unless you take a few critical but easy steps now. …so you’ll have the tools you need to prepare and survive as the world we know is turned upside down! The Next American Civil War is Upon Us! We were taught in school that the Civil War ended with Lee’s surrender at Appomattox in 1865. The second phase of the “War Between the States” has already begun. You see, “Civil War I” – like World War I – was just the preamble to a second, much WIDER conflict. We may not see armed fighting with guns and tanks, at least not right away. But we ARE seeing the first rumblings of Civil War II. And believe me, it's going to get worse. But the election is just another symptom of the most radical polarization in U.S. politics since the Civil War. We went from about a 10% difference in ideology between the average Democrat and Republican in 2004… to 35% just ten years later! And between the most politically engaged, the differential is almost 55%, with the majority of each party on the extreme right or left. Now look at this map of the 2016 election. You probably didn't need to see this to know what it says... left and right have hunkered down into their warring camps. But this is about MUCH more than red versus blue. It's upper class versus lower class. It's the American worker – white collar and blue collar – versus globalization. It's a scared citizenry versus terrorist organizations like ISIS. It’s young versus old over entitlements. It’s third world versus first world countries. It's people from all walks of life saying, "Enough is enough!" But this polarization isn't just happening here in the U.S. In today’s world, we’re so connected that everyone now hates almost everyone else! They’re the beginnings of a worldwide revolution in politics, economics… everything. It’s a global Revolutionary War! My name is Harry Dent. Although I have an MBA from Harvard, and have consulted to numerous Fortune 100 companies, most economists think I’m a nutcase. Because I’m probably the most unorthodox economist you’ll ever meet. I’ve been studying cycles for almost 40 years, but even I learned something when I met Andrew Pancholi. Andy is the Director and Chief Strategist of Cycles Analysis, Portfolio Manager at Fidelis Capital Management,and author of the acclaimed newsletter The Market Timing Report. Last year at my research firm’s Irrational Economic Summit, Andy and I talked for hours about everything from A to Z. And I knew right then that we had to combine our expertise. The result is our new book, Zero Hour: Turn the Greatest Political and Financial Upheaval in Modern History to Your Advantage. It’s our way of helping you through the coming revolution with your wealth secure and growing like never before! Social, demographic, political, and economic cycles. You can’t see them. And you can’t touch them. Mainstream economists and their cohorts in the political establishment don’t even know they exist! But they’re behind every major movement and crisis in history, no matter how hard governments try to stop them! In fact, cycles create those big “unexpected” events… what some people call “black swans”. Only there’s no such thing as a “black swan”. This is just a convenient tag to pin on something “government and economic experts” don’t see coming… because they don’t understand cycles! The Black Monday stock market crash (1987). The dismantling of the Berlin Wall (1989). The Asian financial crisis (1997). The September 11 attacks (2001). Brexit and Trump’s election (2016). Martin Luther and his “95 Theses” (1517). The Mayflower setting sail from England (1620). The U.S. Civil War (1861-1865). The First World War (1914-1918). Right now, three mega-cycles – or “Harbingers of Revolution” – are converging in a once-every-250-year event! This incredibly rare occurrence is what Andy and I call “Zero Hour”. This cycle last bottomed in 1933, when we saw the highest unemployment in U.S. history and the worst of the worldwide Great Depression. The next bottom hit in 1961, with twin recessions in 1960 and 1962. Then we got the recession and savings-and-loan crisis of 1990-91 (shortly after the bottom in 1989). An 80%-plus crash in the U.S. stock market, beginning within weeks! This cycle is easy to see today, because we’re witnessing uprisings and riots almost daily. It started with Brexit, and the election of Donald Trump in late 2016. Devastated by one bubble burst after the next – all while watching the wealthiest 1% run away with 50% of the money – the middle class was ripe for revolt. The rise of Hitler as German chancellor in January 1933 – and Trump as U.S. president in January 2017 – occurred exactly 84 years apart! And guess what Hitler’s whole appeal was? No, I’m NOT calling Trump the next Hitler… I’m just demonstrating this cycle and how precisely it tracks populist movements – and this clearly is one. Roughly 84 years before Hitler, it was Karl Marx, who inspired populist revolts against the European aristocracy. This last hit in the 1760s. The Boston Tea Party, the First Continental Congress, the Declaration of Independence, and the Revolutionary War – along with the beginning of the Industrial Revolution and modern free-market capitalism – all followed in rapid succession. These global paradigm shifts occur once every 250 years like clockwork! More than a religious movement, the Reformation ushered in a broad social and political revolution against medieval feudalism and the dominant Catholic Church… laying the foundation for modern democracy and human rights. 250 years prior, in the late 1200s, we had the voyages of Marco Polo. Maps based on Polo’s travels to East Asia inspired Columbus to set out across the Atlantic, hoping to find a western sea route to India and China. Which means the NEXT revolution is shaping up to be epic in size and scope! But we don’t just have the Revolutionary Cycle hitting now… WE HAVE ALL THREE. A “perfect storm” of major social, political, and economic convulsions at every level. A major financial crash and a deflationary economic crisis like we last saw in the 1930s. A second real estate bust, leaving millions of Americans (again) underwater on their mortgages. The United States breaking into red and blue “common market” zones, with some states actually seceding to form their own independent republics. An entire overhaul of the global financial system. The world map redrawn to finally correct the “errors” of the colonial era. A “bottoms-up” revolution to the very way we do business. Goodbye top-down bureaucrats everywhere! And more changes we can’t yet imagine. Knowing when the big cycles come together is critical. But as an investor, you could still lose your shirt if you’re a few weeks or even a few days late to the party. And that’s where Andrew Pancholi comes in. His research, as you’ll see when you get your copy of Zero Hour: Turn the Greatest Political and Financial Upheaval in Modern History to Your Advantage, includes cycles that predict likely turning points down to the month, the week, and even the day! For example, in 2014, Andy flew across the Atlantic to warn me about the collapse of the euro… to within a handful of ticks. And it bottomed within a few days of when he said it would! You’re unlikely to find a more accurate market forecaster anywhere else. Zero Hour is your playbook to guide you through “The Great Reset”. This WON’T be the “end of the world”. Just the end of the world as we know it! In Part 1, you’ll understand why Andy and I are predicting this world-changing revolution, and what it means for you and those you care about. In Part 2, we show you how to prepare for the first shock: the bursting of the greatest economic bubble in modern history. This book is all about guiding you through the revolution ahead. WHY major shifts like the Great Depression and major booms like the Roaring 20's and the recent 1983-2007 bull market happen… WHEN they will happen… and HOW you can benefit from them. All thanks to the predictive power of cycles. 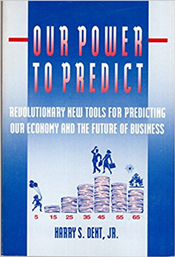 In fact, the first book I ever published was called Our Power to Predict. That remains as true today as it was when I wrote it in 1989 and predicted the simultaneous collapse of Japan and the greatest boom in history in the U.S. and the rest of the world. And now with Andrew at my side, we have better and more integrated cycles research than ever! It’s a timeless truth, yet most people foolishly ignore it. But when YOU are aware of the cycles, it’s easy to take simple steps to survive and prosper as these social and economic forces roll over us. Events are accelerating rapidly, which is why I urge you to get your personal copy of Zero Hour: Turn the Greatest Political and Financial Upheaval in Modern History to Your Advantage today. You can either ride the wave of the future, or get pounded into the sand. Reserve Your Copy Now and I’ll Throw in a Treasure Trove of Bonus Materials You Won’t Find Anywhere Else! 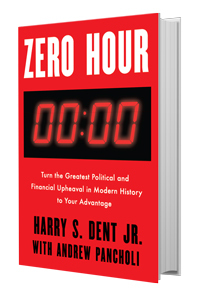 To reserve your personal copy of Zero Hour: Turn the Greatest Political and Financial Upheaval in Modern History to Your Advantage, just click the “Order Now” button below. Your hard copy of Zero Hour will arrive in your mailbox in two to three weeks. And while you’re waiting for your book to arrive, I’m giving you online access to a digital e-book for Chapters 1 through 3… so you can get a head start. You’ll also get access to an exclusive video of my presentation on Zero Hour this past October at Dent Research’s Irrational Economic Summit in Nashville. Attendees paid as much as $895 to be there in person for this event… but I’ll send you the presentation today, as a FREE bonus. I’ll also include my unpublished chapter of Zero Hour, Cryptocurrencies… and the Bottom-up Revolution in Financial Transactions at no cost. It’s clear that with the emergence of Bitcoin and other cryptos, we’re seeing a “currency revolution” taking hold throughout the world. We could well be heading towards an entirely CASHLESS society, where all money moves into e-coins and all transactions are made electronically. What will that mean to you? Well to help you find out I’m also going to give you access to the video presentation cryptocurrency expert and angel investor Michael Terpin gave at the 2017 Irrational Economic Summit. 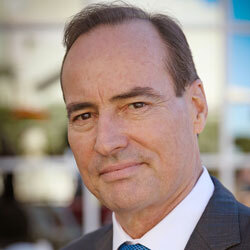 Michael is thought of as one of THE authorities on cryptocurrencies and how to leverage their emergence for profits. 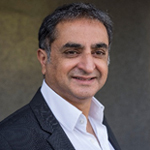 In his presentation he’ll help you separate the fact from the fiction when it comes to new opportunities in this widely misunderstood space. 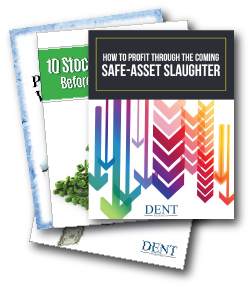 You’ll also get my brand NEW research report just in time for the new year, Harry Dent’s Shocking Predictions for 2018, with my specific forecasts for stocks, oil, gold, the dollar, and real estate. When you respond to this special offer, I’d also like you to have a complimentary 3-month trial subscription to my cutting-edge research advisory, Boom & Bust. Every month, you’ll get an in-depth look at unique economic indicators, global demographic trends, spending wave indicators, and other insights you won’t find in The Wall Street Journal or Barron’s. You’ll learn why you should not be listening to the talking heads and Wall Street pundits… and what investment strategies you should use instead (to capitalize on the predictive power of demographics and cycles). And you’ll get actionable trade recommendations every month from my team that will position you to withstand this crisis and perhaps even profit from it! The 5 Day Forecast: Every Monday, Chief Investment Strategist Adam O’Dell gives you his take on what the markets are doing and how you can stay ahead of the curve, while our Portfolio Manager Charles Sizemore updates you on any movement in the Boom & Bust model portfolio and what actions to take. Monthly Insight Videos: Each month, my longtime business partner Rodney Johnson talks to you about an important financial event and explains in plain English what it means to you and your money. These are MUST-SEE broadcasts that you’ll come away from infinitely smarter and better prepared for what’s ahead. Dent Digest: Every Friday, Rodney will update you on the economy, any changes in trends, news that affects you… and what you should do about it. Special Flash Alerts: Should the markets suddenly change, or red-hot opportunities arise between monthly issues, we’ll send you a special flash alert via email so you don’t miss a single opportunity. We also let you know when a stop-loss has been hit and it’s time to move on. You get ALL this for a one-time payment of just $19.95!!! That’s LESS than what you’d pay for JUST a hardcover copy of Zero Hour: Turn the Greatest Political and Financial Upheaval in Modern History to Your Advantage in a bookstore or online! A fair price to pay, wouldn’t you say? Will you be prepared to take advantage when this global revolution comes or will you go down in flames with so many of the unprepared masses? For just $19.95, you’ll get access to all the life-changing information inside Zero Hour: Turn the Greatest Political and Financial Upheaval in Modern History to Your Advantage, along with all the extra bonuses I’ve just laid out to help you along the way. Imagine… just a few short years from now, you could be sitting on a personal fortune that will last you the rest of your life and for generations to come. But only if you take heed of the obvious warning signs ahead… and take action today to protect yourself and your family from the political, economic and social upheaval that’s about to come. Please don’t take this lightly. The world is becoming an increasingly dangerous place. I want to see you emerge on the other side of this revolution better than you started. So please, request your copy of Zero Hour: Turn the Greatest Political and Financial Upheaval in Modern History to Your Advantage today! P.S. Remember, if you order today, you’ll also get my “lost” chapter, Cryptocurrencies… and the Bottom-up Revolution in Financial Transactions, as well as access to the video presentation of cryptocurrency expert Michael Terpin at my 2017 Irrational Economic Summit in Nashville. This is critical information to have now because the technology behind Bitcoin is going to revolutionize the global financial system. And you’ll want to know how YOU can take advantage of this epic shift for even more money in your pocket!